Question: Why does the Creator demand that we keep laws that we don’t even know? Answer: Today we are on the levels of material nature, the still (s), the vegetative (v) and the animate (a). Here we exist; here we have science and many other means. But it is about laws on the speaking level that belong to the spiritual nature. We don’t know it, we cannot do anything with it, but we still have to ascend to it. This is why we go through sufferings that push us forward. 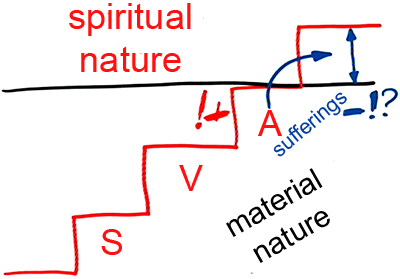 This is why the sufferings come from the highest level that is now gradually being revealed in us, but in a negative form. On the animate level you had everything and felt good about it (+!). Everything was great. Suddenly, however, the opposite is gradually being revealed, a great minus, sufferings: what can we do? We don’t know. Baal HaSulam says, and we also know it from history, that sufferings are revealed in every state so that it will seem unbearable and so that we will rise to the next level. This is how we advance. So today the sufferings are also meant to push us to the next state. Do you want to wait? Then they will be much greater. After all, it is about a qualitative gap here and not a quantitative one. Before, when there was a shortage of food, we could invent some agricultural machine, and when there were not enough means to build windmills we used to borrow money from other people or from the bank, and thus invest my part in developing the economic system. But today we don’t know what to do. You are right about that. But there is no other way; the laws of nature will not be revealed on the current level. The only way is to reach a state of balance with nature. In other words, we have to be integral, “round.” We need unity and equality among people—everything that is related to integrality. In addition we need equality and balance with nature. Otherwise each of us would want to be a billionaire. But it isn’t enough to just make people equal, we also need to discover such equality among us on the corporeal level of necessary consumption, so that everyone will unite equally in order to reach unified mutual guarantee. Thus we will discover the fundamental force in nature from which all the other forces are derived and all the other laws. If we don’t do that, the sufferings will increase until they reach an atrocious extreme. The prophets tell us about it; it is a law. Nature will do everything in order to compel us to reach the predetermined goal. Question: So if we take the hurricane in America as an example, should we understand that the problem is with us, with those who understand all this? Answer: We are to blame since we don’t disseminate this message to others, and so they don’t understand it and don’t change. We are the guilty ones. It is true that we are “improving” and getting closer to one another and thanks to that we are still allowed to study and to prepare. In the meantime we advance and even close the gap a little, but if we lag behind, we will feel terrible blows. The key is clearly in our hands, and therefore we are more vulnerable to problems and troubles. All the problems in the world are our fault. We have to understand that it is a sign for us. If we don’t stop the negative global trend, the troubles will reach us. The only means is connection among us. External dissemination is minor; the main thing is the work among us. If we were totally immersed in connection with the right intention and dedicated all our actions to disseminating our materials in the world, it would be an ideal implementation, the best possible. The intentions should be internal and the actions external. We must only yearn for that along the way, otherwise things will be bad. I Feel Fine, What Else Do I Need? Where To Get A “Plate” For Spiritual Revelation?